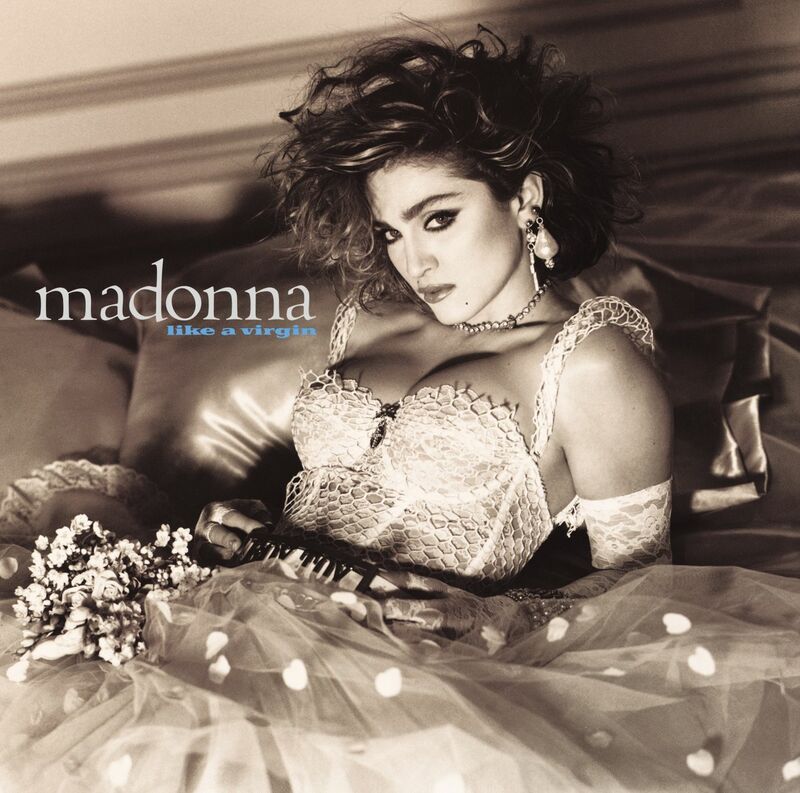 … was released in 1984 on vinyl, cassette and CD and was remastered at least once (see Discogs and AMG). Since this album used early digital technology, some question why the MQA release shows original sample rate as 192 kHz. According to archive records, this was a multitrack recording. 24 of the tracks were captured on a Sony 3324 digital stationary-head recorder (using the built-in converters running at 48 kHz / 16bit) while three additional tracks (containing some vocal and percussion), were recorded to analogue tape. At that time digital mixing was not possible, so the mix was made on an analogue desk and using analogue effects (compressors, EQ etc). This means that some parts of the mix were analogue right through and not limited by the digital converters on the other tracks and that the record was built in the analogue domain in Power Station studios. The resulting mix was captured to a Studer A80 at 30 i.p.s on 1/2″ analogue tape (archive date is 20 April 1984). This tape was the root asset from which analogue vinyl and cassette masters were derived in June of that year. The same tape was also digitally transferred for CD production to a Sony PCM 1610 on 10th July using the built-in converters. Most fans of this record will only have heard one of the various CD issues. We don’t know whether early or later CDs corrected for any sample-offset or whether there was a (not uncommon) 44.1/44.056 pitch error in CD mastering (The MQA release is pitched at A=441.5 Hz; a sample CD runs at A=440.5 Hz). The 2017 MQA release is from a high-quality 192 kHz 24b digital transfer of the original (April 1984) analogue tape using an Ampex ATR104 and a UA2192 A/D converter along with some specific archive techniques. Why was that chosen? 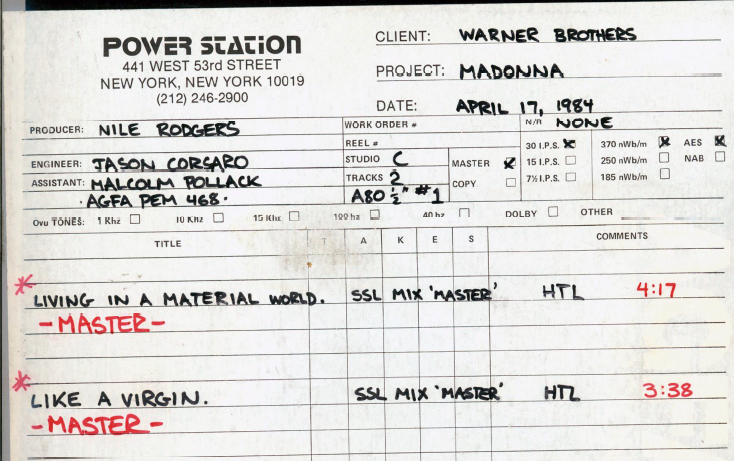 Simply put, Madonna and the team spent hours working on this analogue mix, this is ‘the record’; no PCM tape of the mix predates this analogue mix master. The CD issues start a generation away (via quite dubious converters by modern standards). In comparison with two CD releases, this MQA 192kHz version has a 10dB wider dynamic range; the CDs were pushed up 8.5 dB louder and clipped in places. The analogue master also has a wider dynamic range and lower noise floor than any of the CD releases. The diagrams below show some details from the title track 3. This story illustrates that although measurement tools are useful, we absolutely can’t rely on them in the absence of other information about the recording. In particular, an analysis might flag this album as having been upsampled, but it wasn’t. We just see evidence of the diverse tools used by the artist and producer in the original creation of the album in 1984. 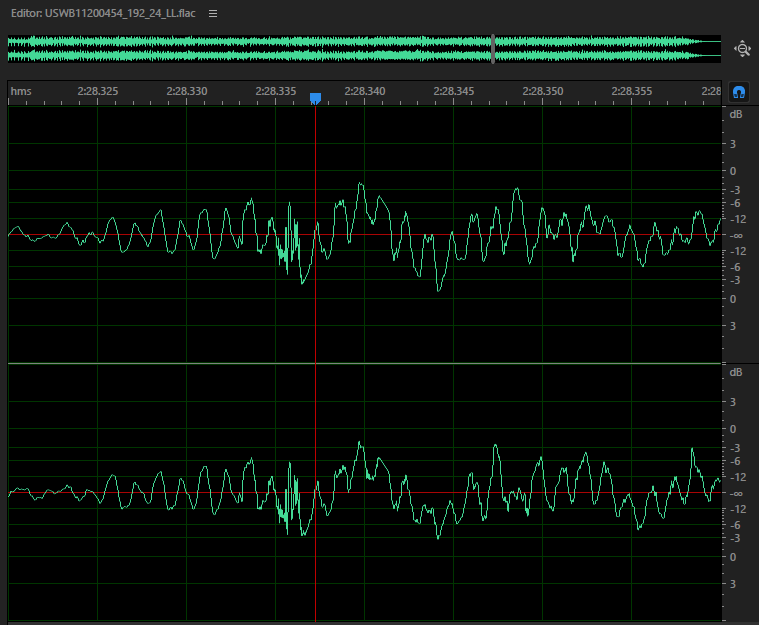 Above: Showing the waveform at 2:28 in the 192 kHz capture from the analogue master. 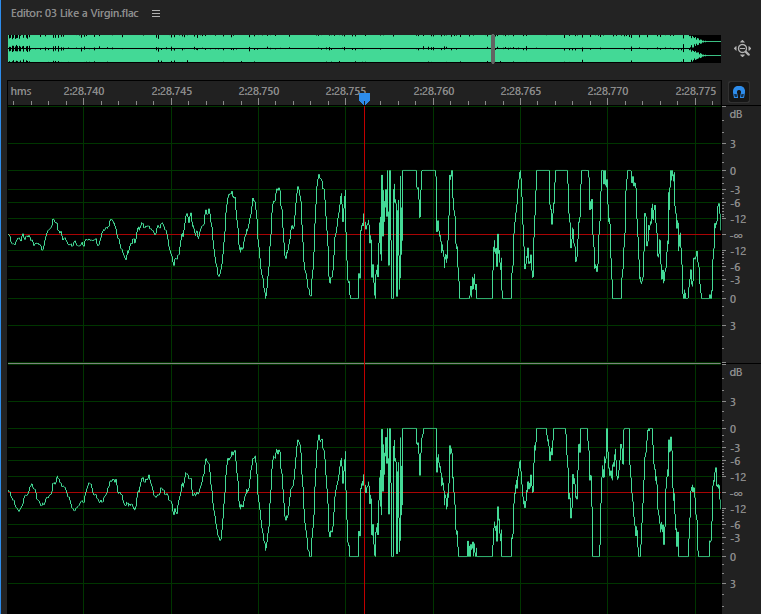 Above: Here is the same moment on a CD (which measures 8.5dB louder). 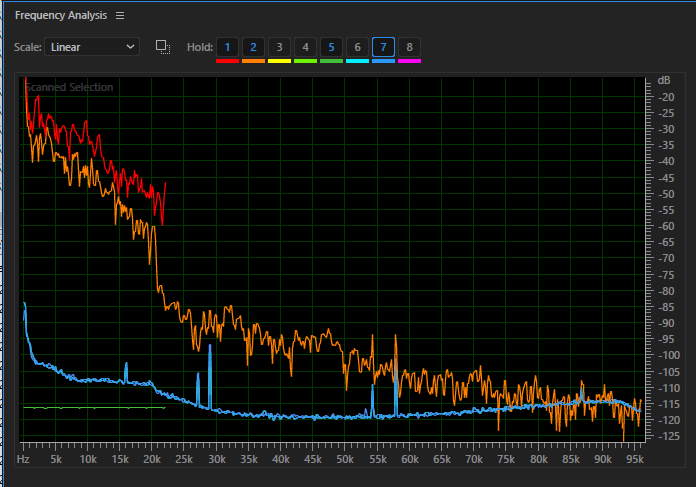 In this spectral analysis above, orange shows the 192 kHz version while red is the CD at the same moment. The CD is both louder and shows high-frequency ‘splash’ from the heavy clipping. The green curve is the channel limit for 16-bit on CD. In the orange curve we can see the signature of the 24 kHz brick-wall filter from the digital stems; but between 20 and 45 kHz we also see significant energy from the analogue stems and effects, indicating that not all the mix made it into the digital releases. The blue line gives us the lowest (at run-out) mix+tape background noise – broadly equivalent to 16 bit level @ 192 kHz and lower than CD noise-floor.